W portugalskim mieście Penela organizowane jest V Biennial of Humor „LUIZ D’OLIVEIRA GUIMARAES”. Temat tegorocznej edycji, to „Od miodu do żądła”. Organizatorzy oczekują na prace czarno-białe (nie dopuszczalne jest użycie trzeciego, czwartego i większej ilości kolorów). Prace należy wysyłać drogą elektroniczna na adres: humorgrafe.oms@gmail.com, humorgrafe@hotmail.com lub humorgrafe_oms@yahoo.com. Termin – 25 czerwiec br. Rysunki powinny być w formacie A4, rozdzielczość 300 dpi. „The humors represent the healthier of all philosophies, which is from those who can laugh. Graphically we find the first images around 7000 BC, in cave paintings of Araña – Valencia. In Ancient Egypt (from 3200 BC) is associated with pharaonic royalty, aggregating in a single hive – federation of all regions of Egypt: the true title of Pharaoh was NyswBit where Bit means bee and it is the symbol of Low Egypt. According to their mythology, Bit was originated from the tears of Ra (the sun god) falling on the earth, establishing itself as a being of multiple richness’s and therapeutic characteristics, while it takes the iconography of the Divine human soul . This spiritual connection arises in almost all of the ancient cultures, representing, often, the belief of survival beyond death, resurrection / reincarnation. This inference to the path of soul evolution leads to an association with initiation ceremonies, in which the Spirit / Word (in Hebrew „Bee” is written „Dbure”, meaning Dbr verb / word) is purified by fire, nourished with honey (mead is the drink of the gods) destroying the impurities / obstacles with its sting. Also Christianity absorbed this allegorical universe in which Jesus takes the bee image and honey is the sweetness of his word / thought as food for the soul and the sting as Christ’s Punisher role. As for Islam, we find in Surata 16: „And your Lord inspired the bees: «Build your hives in the mountains, trees and houses» / … From their abdomen comes out a variety net of colors which heals men. In this are signs for those who reflect.” The bee, in the Vedic texts of India, is the spirit that is drunk with the pollen of knowledge. Briefly, in this brief digression in spiritualities, the bee represents the spirit versus materiality, geometry (divine) against ignorance, social order against disorder. Turning again to the theme of the Biennial, it may be said that the principle is the „pollen”, which in the case of the humorist are the news, the daily which is collected by the worker, and if in the bee that nectar is processed by digestive enzymes, the cartoonist is swallowed by a philosophical mood look, deconstructing superfluous to regurgitate in irony, humor or satire. As honey, not all humors have the same color, not all laugh in the same way or of the same issues, however we want to impose the global village for all beings, things and thoughts. Depending on the fields, blooms, the collected pollen and the preparation techniques, there are several colorings, flavors and tastes in honey. Laughter, even universal as the divine light in the recognition of human fragilities, is looked upon or reacts in every culture, every geographic area and in each educational field very differently. The laughter, comic and humorous, is the result of collected pollens that, depending on their treatments, can be tasted in a territory and not in another. As the honey when its pure, with time tends to crystallize since it was not subjected to temperatures which destroy its bacteria’s, also the pure humor crystallizes in time and along the years with the turns of life, is always present, incisive and active. The sting of the bee / humorist is connected to a venous system that causes an allergic effect, severity which is dependent of the immune system. In the case of satire, the standard reaction to toxicity is concomitant to the educational level of the victims, in terms of their sense of humor, self-criticism capacity, deafness, blindness or mental intolerance. The Greek philosopher Epictetus said: „The world events are not the problem, but the way we look at them.” Like the tolerance or intolerance, the sense of humor must gush from both parts. Honey is one of the nutrients with higher calorie content, rich in vitamins, minerals and bactericide, which gives to it a high therapeutic power (as other products related to bees), complicity that has with the humor. The „apitherapy” as „gelotherapy” are fundamental alternative medicines, because laughter, a byproduct of humor, when „explodes” has an impact on the muscular system, central nervous, respiratory, cardiovascular, immune and endocrine …. For all of that, we can say „Follow the Bee”, which, if it is a barometer of the balance of ecological systems, also humor is the warning barograph of the sanity of society, the democratic balance of power, and reason which both must be protected in order that so that do not become an endangered humanity. So the theme of the 5th Biennial of Humor Luíz d’Oliveira Guimarães – Penela 2016 is „From Honey to Sting” and we invite artists from around the world to meditate about the role of the bee / honey (and other derivatives, in addition to their role in biodiversity) in our society and at the same time, the role of humorist / cartoonist. We can not forget the allergies that were developed against the sting of satire / irony, the fear of the terrorist wasp that has killed, persecuted and oppressed the philosophers of freedom and actuality which is facing an important moment in the game of tolerances and intolerances. Let us not forget that integration only works when the other also integrated, tolerance requires tolerance, and intolerance creates intolerance. 1 – Theme: „From Honey to Sting” invite artists from around the world to philosophize about the role of bee / honey (and other derivatives, in addition to their role in biodiversity) in our society and at the same time, the role of humorist / cartoonist. We cannot forget the allergies that were developed against the sting of satire / irony, the fear of the terrorist wasp that has killed, persecuted and oppressed philosophers of freedom and actuality which is facing an important moment in the game of tolerances and intolerances. Let us not forget that integration only works when the other also integrated, tolerance requires tolerance, and intolerance creates intolerance. 2 – Open to the participation of all graphic artists with humor, professional or amateur. 3 – Deadline: 25th of June 2016. They should be sent to humorgrafe.oms@gmail.com, humorgrafe@hotmail.com or humorgrafe_oms@yahoo.com (If you do not receive confirmation receipt please resend new email). 4 – Each artist can send via e-mail in digital format (JPEG 300 dpis A4) up to 4 works in black and white (one color with all its nuances – not accepted drawings with 2, 3 or 4 colors – is compulsory that two should be on this subject, and the other two can be portraits-caricatures of cartoonists – self-caricature or any of your country masters), open to all techniques and styles as caricature, cartoon, humor design, strip, bd board (story in a single board) … which must be accompanied with information of name, date of birth, address and e-mail. The jury, at its discretion, may grant „Special Awards” (António d’Oliveira Guimarães, Municipality of Penela. Junta de Freguesia do Espinhal and Humorgrafe), an honorific title, with a trophy. 6 – The jury grants the right to make a selection of the best works to exhibit in the space and catalog edition (which will be sent to all artists with works reproduced). 7 – The Organization shall inform all artists, by email, if they were selected for the exhibition and catalog, and also the winning artists. The works awarded, are automatically acquired by the Organization. The originals of the winning entries must be submitted to the Organization (the original work made by computer is a high quality print in A4, with hand signature and numbered 1/1), because without such delivery, the monetary prize will not be unlocked. 8 – Reproduction rights are owned by the Organization, to promote this event, and eventually will be discussed with the authors in the case of other uses. 9 – For further information contact the Artistic Director: Osvaldo Macedo de Sousa (humorgrafe.oms@gmail.com) or V Biennial of Humor Luíz d’Oliveira Guimarães Culture Sector, Municipality of Penela, Town Hall Square, 3230-253 Penela – Portugal. 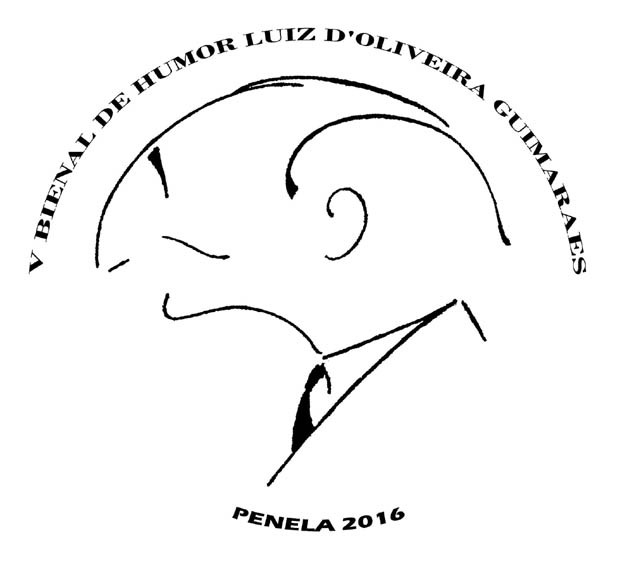 10 – The V Biennial of Humor Luíz d’Oliveira Guimarães – Penela 2016 takes place from 3 to 21 September in the Cultural Center of Espinhal, but the woks can also be exhibited in other locations to be designated.